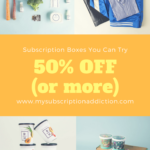 Coupon: Use code VIP25 to save 25% off your first box! Normally this box comes with an info booklet, but this month The Bless Box went green! You can visit the webpage here to see the full details of the items in this month’s box. This month’s box also arrived late, and I believe they will be sending a bonus item in the March box to make up for the hassle! This heat-activated spray is designed to protect against frizz for 2-3 shampoos! Unfortunately, you need heat to activate the frizz humidity guard of this spray, and I do not own a blow dryer. I am looking to get one soon, though, so I am hanging on to this for the future! We also received a coupon from the brand. This liquid lipstick is a bright coral pink, and it’s staying power is impressive! This left my lips feeling a little sticky, which isn’t my favorite, but this has no transfer and it seriously lasted all night (and into the morning). You can see me wearing it here. These pop up in subscription boxes frequently, but I am not mad about it- wearing a metallic gold eye mask is always fun. These are designed to brighten, hydrate, and reduce the appearance of dark circles. In terms of results, I don’t think these are the most impressive, but I am happy with the added nourishment this gives the area under my eyes (I like to wear these while I am applying my eye makeup to catch any potential fallout). I love hand masks- I am always rough with my hands, and I am not the best about religiously applying hand cream or cuticle oil. Masks like these always make my hands happy, and this is made with vanilla and sweet almond extract so it smells good too. Soo AE is a fun K-beauty brand, and each of these masks has a little pizazz. The hydration alert mask has a pattern that will actually change colors based on your skin’s temperature, the rose mask has actual rose petals in the sheet mask, and the hologram mask is actually holographic! All of these masks had good ingredient lists, and I am always happy to see this brand in boxes. This product is a new one to me, and I absolutely love it! It has the texture of shaving cream, but it’s a soap! It is a refreshing blend of Mint and Eucalyptus, and honestly, this is just a fun way to get clean. These bath salts are really cool- they turned my bath water electric blue! These are made with valerian oil and hops extract, and the earthy scent is very soothing. These bath salts are perfect for relaxation, and I’m considering buying more! I love chocolate covered almonds, and this mini snack pack is the perfect amount to quell a sweet craving without mindlessly eating 100 almonds (which I could do with ease). This little pack only has 60 calories, and think these are the perfect purse snack. These masks are designed to be worn when you already have your makeup on and you’re getting dressed in order to keep makeup from getting on your clothes. I appreciate the idea, but I don’t really have a use for these. Maybe if I had fancier clothes I would be more concerned! Wow, this is pricy! This moisturizer is designed to reduce the appearance of wrinkles while also providing SPF protection. This felt nice and absorbed easily into my skin, but I wouldn’t be able to justify the full-size version. Getting a sample in a box like this is nice though because the sample is worth more than the cost of the entire box! This is a dry conditioning spray that is designed to reduce frizz, and it does just that! I think this made my hair feel a touch softer, and my curls can always use help with frizz in this Louisiana humidity. The Verdict: I loved this month’s box! The combination of fun sheet masks, chocolate covered almonds, and high-quality skin and hair care made this box a success, and this box was definitely worth the wait. Value-wise, I calculated a total value of $151.36, which I think is awesome for the cost of the box. Can you still get this box if you sign up today? No, but subscribe by the 17th to receive March box. I really want to just be like really “wowed!” by this box! I really keep trying. I really liked the mystery box from last month and the price for that was great. But the price for the sub box plus shipping has me held off. Btw, for anyone who wants to try the SooAe masks, they are at Walmart regularly priced for $2.50 each, these flavors included. I LOVE color wow dream coat!!! I’m on my second bottle. It makes my thick wavy hair, super soft & smooth, & I don’t have to straighten my hair when I use it! It is so good! I do wish it was heat activated though! But, until I find a product that delivers the same results without using heat , I will keep using the dream coat!! February was a strong month. I like. Hope they keep it up. What are your favorite eye masks and why? I figured with all the subs you try, you’d know the best ones. My all time favorites are a tie between the Erno Laszlo Multi-Task Eye Serum patches and the Milk Makeup Cooling Eye Patches (not a subscription box find). The Milk makeup ones are much more affordable and are slightly adhesive so you dont have to be laying down to wear them, but I love reaching for the Erno Laszlo when I have a big event. If I just want one to relax and will be laying down, I’ll reach for the Blaq eye patches they came in previous FFF box. Thanks so much! It does help! Just wanted to say Love the changes to the site. Being able to get rid of all the prompts at once is wonderful! !